Last weekend I finished Bottom Dwellers, a love story and SiFi thriller. The main character, Patrick Dylan, encounters a race of secretive mutant people in Georgia’s Lake Lanier while scuba diving. He also meets Trudy Price, a beautiful park ranger who soon becomes his fiancée. They discover both good and bad among the bottom dwellers of Lake Lanier, in this fast-paced read written by Shane Etter. Shane does a great job creating suspense in surreal settings — first in an abandoned amusement park at the bottom of the lake, and later, in underground Manhattan where Trudy and Patrick meet another race of dwellers who occupy the city’s abandoned subway and train tunnels. Patrick and Trudy were easy to root for as they fall in love and face a scary and elusive foe that can read minds and appear when you least expect it. 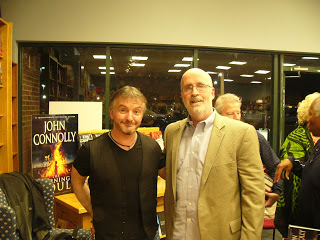 Here, Shane talks more about the inspiration for his story, and how a stroke drew him into the craft of writing. How did you get the idea for Bottom Dwellers? it’s a pretty unique story line with some colorful and in some cases, creepy characters. I was reading in the Atlanta Journal-Constitution about how the Corps of Engineers acquired the land for the lake, and left the houses there, since they would be under 100+ feet of water. I immediately turned to my wife and said, “What if there are still people living in those houses?” The idea was born. Have you always enjoyed supernatural, science fiction and fantasy books? Not really, I’ve always been kind of a thriller guy, but I’m sure I can move the Dwellers series into a mainstream thriller storyline. I know you began to write full time after a stroke? Can you tell me how writing and the creative side of your brain has turned on to allow you to pursue being an author? My stroke was in ’04. In ’07, my brain really went through a healing cycle and almost overnight I became creative and started writing Bottom Dwellers. You did a nice job of using setting and place to tell your story – first in the Lake Lanier area of Georgia and later, New York City. How important is establishing setting as a backdrop for your story? To me, setting is another character in a story and just as important as other characters. The main characters in your book, Patrick Dylan and Park Ranger Trudy Price, are pretty compelling. How true-to-life are they to you, especially given that you collect wine and have two standard poodles just like the characters in your book? Well, my wife, Ellen, is as beautiful as Trudy and gets told she looks like Mary Steenburgen frequently. Patrick and I are alike in that we are both curious and loyal, but Patrick is taller than me and much braver. When he first met Caliph and Caliph told him to leave and not come back, I would have been out of there. Yes, we are wine drinkers and Hawk and Pearl the lights of our lives. When can readers pick up this story of Patrick and Trudy and these supernatural creatures who live among us? Can you give us a sneak peek of what to expect in your next book and where to get a copy? Bottom Dwellers is available now at most online retailers, including the biggest ones. The next stories in the series are Radiation Dwellers and Island Dwellers. RDis set in north Georgia at the site of the ruins of the Georgia Nuclear Aircraft Laboratory and find Patrick and Trudy battling a different kind of mutant, mutant tree people. IDis set in New York City and while in NY for a trial of a criminal they helped capture in Bottom Dwellers, Patrick and Trudy are followed by different mutants this time and it leads them on a quest to discover and expose a worldwide mutant community. What one aspect of your writing has improved from your first book to subsequent titles in this series that you are now completing? I think I’ve learned how to write a more complex plot on a deeper level, on a simpler level, in Bottom Dwellers I didn’t use many contractions when writing dialogue; now I do. Everyone uses contractions when speaking naturally. My writing sounded stiff without them. Shane is a native son of Mississippi. He is proud of the great literary heritage of his home state and that some of the finest 20th Century authors, like William Faulkner, Eudora Welty, John Grisham and others have called home. Although Shane is primarily a self-taught writer he has taken a number of writing workshops by such noted authors as Mary Helen Stefaniak, Kaylie Jones, Nancy Knight, and two-time Pulitzer nominee, Jedwin Smith. Shane makes his home in north Georgia, where he is currently working on the next Patrick Dylan and Trudy Price adventure and where he lives with his wife, Ellen, along with their two standard poodles, Hawk and Pearl. He is the president of his own small high technology company and collects books and wine; he also enjoys working out in his spare time. 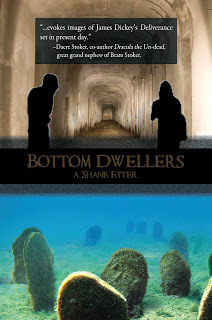 This entry was posted in Author Interviews and tagged Bottom Dwellers, horror/SciFi books, Shane Etter on May 20, 2012 by AnneWainscott.